Dumbing Us Down: The Hidden Curriculum of Compulsory Schooling. by John Taylor Gatto. A rationale and justification for homeschooling. Recipient of the New York State Teacher of the Year award, the author regards high volume standardized mandatory schooling as being more indoctrination than education. He maintains that conformation to economic and social norms are more effectively conveyed by the mass production methods of government schools than are creativity and the ability to think critically. The Call To Brilliance by Resa Steindel Brown. 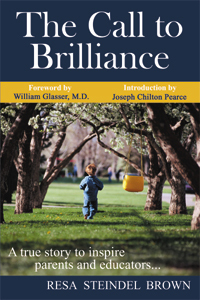 Endorsed by William Glasser, John Taylor Gatto, Jack Canfield, Joseph Chilton Pearce and many others, Resa Steindel Brown contends that all children are born brilliant. Both an educator and a parent, her expertise is in building educational processes and environments that enable children to find their passion and to develop innate and individual brilliance. The Call to Brilliance is a true story of the children who followed their passions from childhood into adult life and found that brilliance. The Successful Homeschool Family Handbook by Raymond S. and Dorothy Moore. Both Dr. and Mrs. Moore are qualified educators and are fully cognizant of methods used in primary and secondary education in America. They don't so much decry these methods as promote alternative homeschooling methods as being superior. This book encourages parents to keep children at home from infancy through school-age and recommends teaching reading only when the child is ready, generally between 8 and 12, due to potential problems with vision and self-esteem that may otherwise occur. Flexible curriculum is the key -- study based on the interests of the child. Volunteer work is encouraged. Although the authors come from an Adventist background, religious references are not overwhelming and specific religious focus is only evident in the recommended reading list. Better Late Than Early: A New Approach to Your Child's Education by Raymond S. Moore, Dennis R. Moore, and Dorothy N. Moore. The authors contend that children can't effectively learn until they are developmentally ready to do so. Issues involving vision, hearing, coordination, ability to focus, emotional stability, and others are explored and the conclusion reached that that an early start is more often a detriment to child development than a boon. Age ranges and natural abilities are explored extensively as is the premise that a home environment during the early years of development is far more conducive to psychological health than that of a classroom of children conditioned to mock and deride their fellows. Home-Style Teaching: A Handbook for Parents and Teachers In this book, master teachers and pioneers in the home school movement offer time-tested insights on how to become a "great" teacher -- and unveil the secret of how to assure your children the best education possible. Learning in Spite of Labels This book would help anyone who has a child who is struggling academically, emotionally, or physically. Written from a Christian perspective, the author's suggestions are practical and easy to implement -- ideal for families dealing with with special needs children. Easy to read chapters are written in plain language. Easy to understand and implement. The Basic Steps to Successful Homeschooling Heavily Christian approach to homeschooling. Mary Pride's Complete Guide to Getting Started in Homeschooling The classic work. Every aspect of homeschooling from a Christian perspective.